Moskowitz, Ooi, and Pedersen recently posted a paper on SSRN called "Time Series Momentum." This same paper was published in last month's Journal of Financial Economics. Most momentum papers deal with cross-sectional momentum in which a security's out performance relative to its peers predicts future relative out performance. In time series momentum, a security's own past excess return predicts its future performance. This is functionally equivalent to "absolute momentum," that I described in my paper. The authors examine time series momentum across equity indices, currencies, commodities, and bond futures. 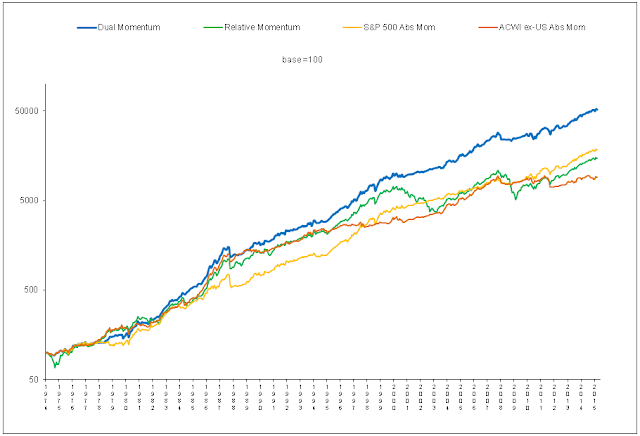 They find that a diversified portfolio using 12-month time series momentum with monthly rebalancing earns substantial abnormal returns and performs best during market extremes. It is good to see validation of the absolute momentum concept. The best scenario, however, is a combination of both absolute and relative momentum as per my latest research paper. 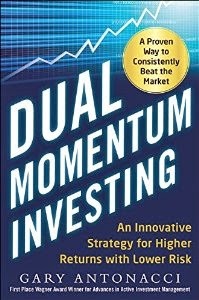 That way you can potentially benefit from relative strength momentum with respect to asset selection and the drawdown reduction that comes from absolute momentum.